When George Washington went shopping for native plants for his gardens at Mt. 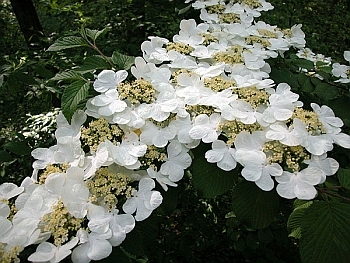 Vernon in March of 1792, he ordered two plants of Viburnum alnifolium, "a handsome flowering shrub", from the nursery of John Bartram, Jr., located on the banks of the Schuylkill River near Philadelphia. The younger Bartram had inherited the gardens and nursery from his father, John Bartram, Sr., the renowned colonial American botanist, plant hunter-collector and traveler. The gardens and nursery were so highly regarded that Washington himself visited twice, on June 10 and September 2, 1787. Five years later Washington directed his gardener to purchase some 200 plants from Bartram’s nursery which included the handsome Viburnum alnifolium, now called Viburnum lantanoides. About 200 + years later I was driving along Rte. 28 in the Adirondacks when I noticed the understory of the woods wildly abloom with white flowers, but they weren’t growing from the soil - they were on shrubs - everywhere! What could they possibly be? "Oh, that", replied my hostess, "up here we call it ‘Adirondack Dogwood’". Hence my introduction to Viburnum lantanoides. This "handsome flowering shrub" is a shade-loving plant that also likes cool, northern climes. But you don’t have to go to the Adirondacks to find it. Dudley listed it in his Cayuga Flora 1886. Wiegand and Eames, in their Flora of the Cayuga Lake Basin 1924, list it as "frequent" and cite ten locations in the Cayuga Basin: on the shaded south slope of Enfield Glen, Six Mile Creek ravine, Fall Creek gorge, Salmon Creek, Etna to Ringwood, the McLean and Freeville "swamps", to name a few. Given these locations we can conclude, correctly, that this plant likes a moist area. More recently I have seen it in the woods on a cool, north-facing slope in Shindagin Hollow and also on a similarly cool hillside on Rte. 79 near Lisle. And what does this plant look like? It is described as a "straggly shrub" whose height is usually in the 3-6’ range but can grow to 10’ high. Its width ranges from 4-12’. A very succinct description in the New England Wildflower Society seed catalog says it all: "Hobblebush is one of the stars of the great north woods, boasting lovely white flowers, large fruits turning red then black, and exquisite fall (leaf) color that ranges from burgundy to pink with a hint of lime." In early spring, (April 20-May 20) "the leafless branches are decorated with flattened disks of whitish flowers surrounded by a ring of 1-inch-wide, 5-parted flowerlike bracts." [The outer ones are actually sterile flowers -- meaning their stamens and pistils don’t develop.] Wildflowers of the Adirondacks says that the flowers at the edge of the 2-6" wide clusters are larger than the ones at the center. Large, opposite, heart-shaped leaves 3-8" wide, are strongly veined, saw-toothed and have rust-colored hairs on the undersides. They produce fruits, or drupes, that change from red to dark burgundy to black as they mature. The fruits are a food source for six species of birds: the Ruffed grouse, Brown thrasher, Swainson’s thrush, Cedar waxwing, Red-eyed vireo, and Pine grosbeak. Way up north the moose like to browse on the large leaves of this shrub. There are several common names for this plant, most often called Hobblebush. In addition to the aforementioned Adirondack Dogwood, it is also known as Witch-Hobble, Trip-Toes or Tangle-foot for good reason. In some woodland areas it grows in dense thickets, because the lower branches curve toward the ground where the tips sometimes take root, creating a snare for the unwary hiker, or worse in the olden days, for a horse. This is more common in the Appalachian Mountains and in the Adirondacks where heavy logging has taken place. In most parts of New York, and in the Finger Lakes especially, Hobblebush occurs in much thinner patches in cool, moist forests with acid to neutral soils. Can this imposing plant find a place in the home garden, yard or woodlot out back? William Cullina, of the Garden in the Woods in Framingham, MA, calls it "one of the stars of our garden" with magnificent flowers in the spring, large, leathery oval leaves in the summer which then turn an incredible mix of mint green, pink and burgundy in the fall and in the winter the "picturesque horizontal branches are lovely, silhouetted in the snow." He further promises that in the garden this plant, Hobblebush, is satisfied to remain a domed clump which will not produce those errant root suckers for which it is named! If you have a cool, shady place with a northern orientation and well-drained moist acidic soil this plant could do well. With its year-round attributes it could be a showpiece. But patience is needed - it takes two years for the seeds to germinate, and it is very difficult to find a nursery that sells the plants. It is worth finding in the wild just to have a look, but leave it alone - it doesn’t transplant well.